Entry filed under: Park Improvements. Tags: archive images, Farilawn Park, HOME PARK, Se26, SYDENHAM, Sydenham Road. This pic brings back very many happy memories. I was born in 1944 and lived in ‘new flats’ at top of park (Kent House Buildings) now called Lucas Court I believe. 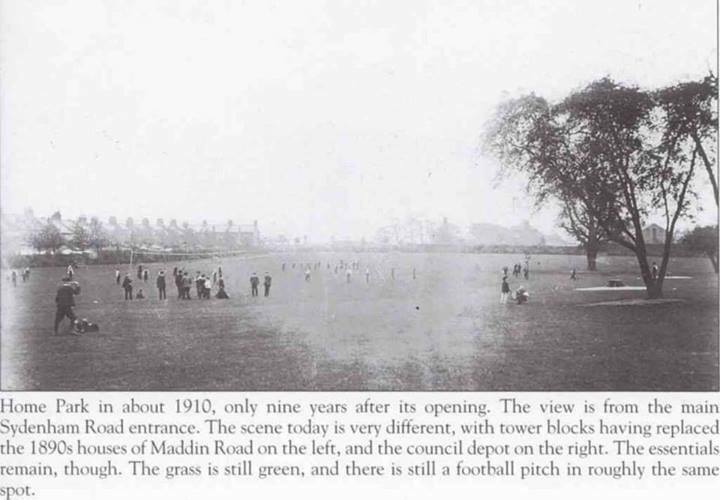 As kids we were always playing in the park and had annual football matches – Flats v Porthcawe and Maddin Road. In my time, there was only one large tree in the centre of the park and that had a circular seat around its girth. Every day I walked to St Michaels school through the park and had to cross the main road near the children’s hospital. My old aunt eventually lived in one of the tower blocks mentioned but unfortunately she died a few years ago in her nineties. When we visited her I always took the opportunity of looking at the park from her lounge window. Happy days!! what a lovely story. I’m so glad you wrote on the blog. If you have any other memories of the park, or the Library, Fairlawn park etc or even just Sydenham in general, it would be a honour if you shared them with us.